Join in so we can share a love of wine! * checking out new music, and totally digging it! * walking home at 7:00 before sunset! While waiting for my BART train in Berkeley I saw two people getting off the train from San Francisco, each carrying a pillow. No sleeping bags or suitcases, just pillows. It's not the strangest thing I have seen on the BART, but it did make me stop for a moment and wonder "why?". Well DUH! Obviously they must have just come from a massive PILLOW FIGHT in San Francisco! It was "organized" entirely over the internet, so naturally the event is already well documented on Flickr. 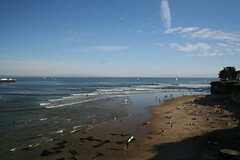 We travelled to Santa Cruz this weekend and surfed Cowell's Beach. Yes, I "surfed" for the first time! Mostly that meant hanging out in the water with a board, paddeling, and fighting the waves. I did get some "rides" in after Dom gave me a little push to get started. I am blown away by the new chat feature in Gmail. My friend, who is currently traveling in Bolivia, suddenly appeared in my buddy list. At first I was confused because we don't IM but then I realized...she must be using her Gmail account and since she's a contact of mine she automatically appeared when she logged in. "Honey where is the battery for the camera"
Oh Yes! That's right. 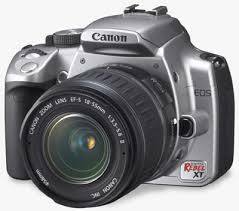 The Digital Rebel XT I got for Christmas from my wonderful husband. Now I can finally stop adding it to my Amazon shopping cart just to see how it feels to almost own it. Let the Flickr games begin! Me: (fumbling through my change) $2.75!? For Water? I can't afford that! Cashier: Oh honey, just wait until you are a big Doctor. Me: But I AM a DOCTOR!